Apotheosis in Tamriel is not limited to Talos, who was Tiber Septim before becoming one of the Nine. 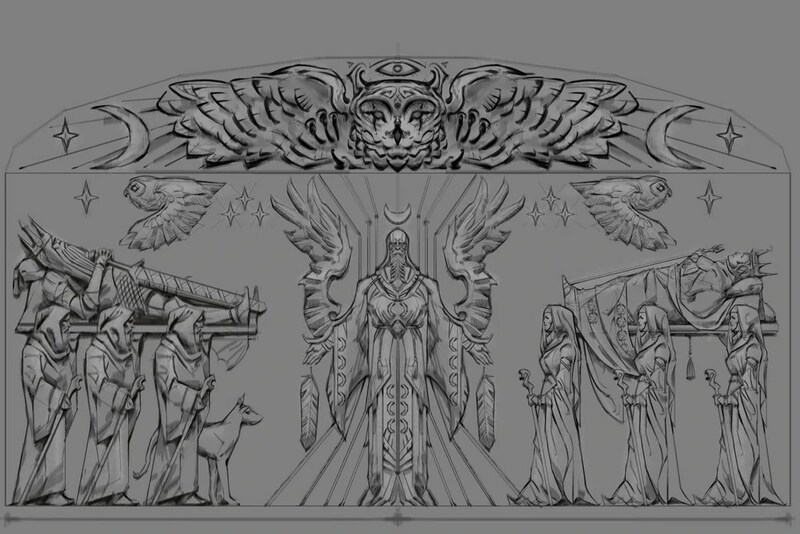 Indeed, Reman Cyrodiil, now called the Worldly God, was known before Ysmir: first as the greatest hero of the Akaviri Invasion of the First Era, and then as the ruler of the Second Empire. Under his dynasty, the Empire conquered all the kingdoms of Tamriel save for Morrowind…and it was Morrowind, and the Morag Tong, that led to his demise. There is no obvious cult of Reman these days, but he was worshiped alongside Talos as a conquerer-god, and there is documentation to support this worship dating from as late as the first century of the Third Era. His rise to godhood stems from the heroic acts of his life – in addition to routing the Akaviri, who called him Dragonborn and swore their loyalty, Reman created the rites associated with ascension to Emperor and is credited with the creation of the Amulet of Kings. Scholars disagree on whether Reman held or was held by the Amulet, but it none can contest that the process of becoming Emperor is his. When we look at the cultural god-kings of a prior civilization, it is useful to examine the qualities they embody. Reman, like so many other deified beings, was a hero who freed Cyrodiil from an invading force and brought prosperity to its people…from the Imperial point of view, anyway. This raises the question of similarity between practices for the cult of Reman and others – the archaic and classical hero-cults of Greece, for example, or the imperial cults of Rome – and I feel confident in saying that those who desire to worship Reman in such a way will do so with the Worldly God’s blessing. However, I prefer to think of the qualities not specifically mentioned that nevertheless would have been crucial to his success, and to base my approach to him on those very things. As an example, consider that Reman is said to have convinced the Akaviri to support him in the founding of the Empire, and the actions documented by historians appear to bear that out. His powers of persuasion were significant, and the ability to sway others to my cause, to cause them to focus on what I want to accomplish, is something that I use in my work each day. It should be no wonder, then, that I look to Reman to strengthen my ability to persuade others that what I ask of them is both reasonable and desirable. For ideas on how to incorporate the worship of Reman into your personal practice, I recommend looking to modern worship of other deified mortals such as Heracles, or Gaius Julius Caesar. Often viewed as the weakest of the Daedric Princes despite often appearing as a dragon, Peryite oversees the lower planes of Oblivion and keeps order among the low-ranking daedra. Men and mer know him as the Lord of Pestilence and the Taskmaster, and his spheres of influence cover both those things along with “natural order”. Peryite is known as having impacting most of the mortals of Nirn, albeit indirectly, since many plagues and pestilences originate with him. In addition, the “natural order” of Peryite and his followers appears to differ from the “order” imposed by Jyggalag, and also from “order” as mortals understand it. This leads me to steer away from talking about the concept of “natural order” in this particular post, and more toward what I consider the inherent duality of Peryite. I am often fascinated with duality (those who know me are thinking, “Really??? I had NO idea.”), and Peryite pleases me in that one overseeing pestilence is also one who can remove it. The Disease and the Cure, if you will; one hand gives, and the other takes away. In truth, Peryite’s followers are often afflicted with one disease or another and consider their condition to be a gift rather than a curse…which leads me down a mental path of wondering about wallowing in the Wretched to find the Divine. I am a Kemetic, and a FlameKeeper, and also working on mindfulness practice – in all of these, the idea that one must recognize and acknowledge reality is key. Couple this with the tenet, from FlameKeeping, that everything is Divine (you, me, the tree, the rock, and my left shoe) and things begin to get interesting – reality is Divine. And if reality is Divine, then those things that exist within reality are Divine by default. This belief must be held by the followers of Peryite, or else why worship the Taskmaster in the first place? And if held by them, this pinpoints something we have in common, for I am hard pressed to think of anything that is not Divine. For those looking to worship Peryite, incense is a traditional offering (and there is a traditional type that is nigh impossible to make outside of Tamriel). I suspect, though, that the Lord of Pestilence might be pleased with an acknowledgement of the pitfalls we all face, how they fit into the larger the Divine, and Peryite’s place in that scheme. Orkey, the “Old Knocker” is an adversarial god of the Nordic pantheon, and his worship is recorded as having started during the Aldmeri rule of Atmora. At that time, it is said that the Atmorans had lifespans as long as the elves and that it was a bargain with Orkey that tied their lives to “the count of winters”. It is further stated that Orkey actually summoned Alduin the World Eater to devour the lifespans of the Atmorans, and it took an intervention from the ghost of Shor and the life of King Wulfharth to save them. In my post about Fox, I mentioned that it is likely that this symbol is meant to represent Orkey, and I also stated that Orkey deserved his own post. He does, and as I’m becoming more interested in the concept of the adversary I thought I could explore him in that vein. What is an adversary? Well, strictly defined (because words mean things) an adversary is “one’s opponent in a contest, conflict, or dispute”. It has a negative connotation, and many people think of the word in that manner, but anyone can be (and is) an adversary at one point or another. If I take an opposing position to my friend on an issue, or compete against them in a contest, I am an adversary. If I routinely disagree with someone, our relationship is adversarial. However: I can, and do, have adversarial relationships that aren’t necessarily negative. Disagreement and opposition are opportunities for growth and change, and as I believe stagnancy should be avoided, I actively seek out such opportunities. This means I routinely run into people who take on the role of my adversary…but that doesn’t mean that I dislike those people or wish them to be destroyed (except sometimes). In fact, in a recent discussion on The Cauldron there were several people who took up an adversarial position to my own and I (mostly) think I benefited and learned from those exchanges. In a religious sense, the idea of the adversary is often conflated with evil. In Christianity, for example, Satan is given the epithet of “The Adversary” and is painted to be the epitome of evil, and as not too few modern polytheists were actually brought up with this mindset, it spills over into other mythos as well. Both of my primary deities, Sekhmet and Set, take on the role of the adversary in the Kemetic mythos and there are a great number of people who are hesitant to approach them because of it. Neb.y Set is especially associated with evil by non-Kemetics and has been for millennia, as can be seen in his Greco-Egyptian association with Typhon. And yet, the inhabitants of Ancient Egypt knew that the adversarial role did not directly equate with evil and that Set as adversary was necessary to uphold ma’at. In thinking about Orkey as a Set-type adversary, I think he can be associated with more than trickery and mortality – as Set is god of the Other, so can Orkey be associated with Other and Foreign things, things that go against the traditional grain and upset the applecart, as it were. To worship Orkey, then, is to acknowledge the parts of us that long not to follow the crowd, to be independent thinkers, and put our thoughts into practice. To worship Orkey, or any adversary, is to revere individuality and personal freedoms. I’ve noted previously that the Ancient Nords, during the rule of the Dragon Priests, worshiped nine animal gods – six shown as male, and three as female. The Owl is said to represent Jhunal, Nordic god of wisdom and knowledge, and the creator of mathematics and language. Interestingly enough, Jhunal appears to have fallen out of favor at some point; he is absent from the modern Nordic pantheon, replaced by Julianos of the Nine (Eight) Divines. Jhunal is also barely mentioned in written record, aside from a brief description in Varieties of Faith in the Empire, though Vivec does mention him in Sermon Three as one of the eight known worlds. Unlike many of the supposed “same god, many names” examples that I’ve mentioned in other Elder Scrolls-based posts, Jhunal being Julianos makes a great deal of sense to me: both are hermetic gods, both have the same bailiwick, and Julianos appears just as Jhunal disappears. Add in the fact that the Nords are quite loyal to their gods and reluctant (mostly) to replace them with Imperial stand-ins, and it makes me wonder if this is a case of the Imperials borrowing from the Nords instead of the other way around. While I’ve mentioned that I have no intention of adding Julianos to my personal pantheon, I can’t help but think of the owl as his symbol, and the fact that I am sure that Julianos is a deity in service to ma’at makes me think that some worship of him, and some representation of him, wouldn’t go amiss…but I’ll have to ponder that further. For now, though, Owl as the Ancient Nords used it stands strong as a representation of language, mathematics, wisdom, and magic, and can be used by modern pagans in that vein. Deep within the Scuttling Void dwells Namira, the Lady of Decay. Namira is not as well known as some of the other Daedric Princes. She (for she presents as female) is the Spirit Daedra, ruler of sundry dark and scuttling spirits and doesn’t have the popularity of Azura, for example, or the gregariousness of Meridia. Her followers tend to keep to themselves, or gather only in small groups, and she prefers them to be repulsive, as is evidenced by some of her epithets: Mistress of Decay, Devourer of the Dead, and the Great Darkness. These blessings made the prince renowned among the beggars, and Namira remains associated with beggars to this day. In addition to beggars, most cannibals in Tamriel consider Namira to be their patron, and she is associated with all manner of “creepy crawly” – spiders, insects, and slugs to name just a few. Believing, as I do, that seeing both sides of the coin leads to gaining the entire perspective on something, I am fond of the idea of Namira and that the wretched and repulsive has a champion in her. I have no personal experience with her, though, and so I cannot say if that fondness would translate if I were in her presence. (I suspect that I’d hit the floor and grovel if it ever occurred). Rather than turning to cannibalism, I suggest that those who wish to connect with Namira cultivate a place for the repulsive to dwell and spend time in communion in that place. For example, flat stones could be placed on the ground and insects, worms, and other creatures encouraged to live beneath them, and then the stones turned over from time to time to contemplate the mini-habitat beneath. Of course, if that’s too much, you could always volunteer to help the downtrodden. The Hidden God. The Missing God. Spirit of Nirn. Creator-Trickster-Tester. Sep. Shor. Sheor. Shezarr. Lorkhaj (the Moon Beast). Lorkhan (the Doom Drum) is mentioned in every known mythology across Tamriel, and has many names to show for it, although he is most often called by his elven name. How he is portrayed in those mythologies varies – men view him as their creator, having brought them into existence out of nothing, while mer were created by the Aedra and Lorkhan is the one who stripped them of their immortality. Nirn, the Mortal Plane, is Lorkhan’s creation, and remnants of him are found everywhere – from the dual moons Masser and Secunda that are called his “Flesh-Divinity” (corpse) to Red Mountain in Vvardenfell created of his heart. He is associated with Sithis (the Void), and personified by the Shezarrines. But, Lorkhan himself is missing, and this point is what makes him so enigmatic (in my opinion). As far as I can tell, Lorkhan himself is a reference point rather than a worshiped god. Because he is present, in one form or another, across Nirn, I felt Lorkhan needed to be included in my series of Elder Scrolls-based posts. Yet, I find it difficult to put Lorkhan into modern context – other than the fact that he created mortal man, there’s no link between him and those of us who do not live on Nirn. I therefore recommend that anyone wanting to meditate on Lorkhan contemplate their own mortality and how our lives are shaped by the fact that we, too, shall end.